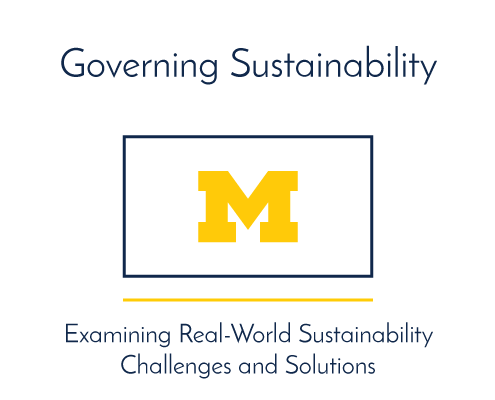 The Academic Innovation portfolio includes initiatives from across the University of Michigan campus. 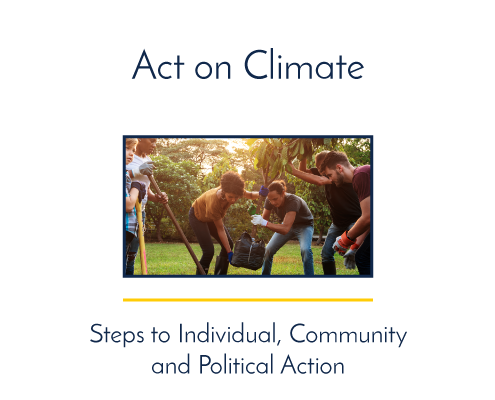 This page allows you to explore initiatives to give you a better understanding of what we do and how you can work with us. 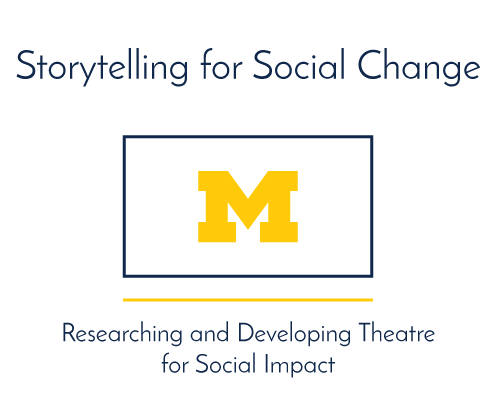 Interested in creating an initiative or exploring an idea? 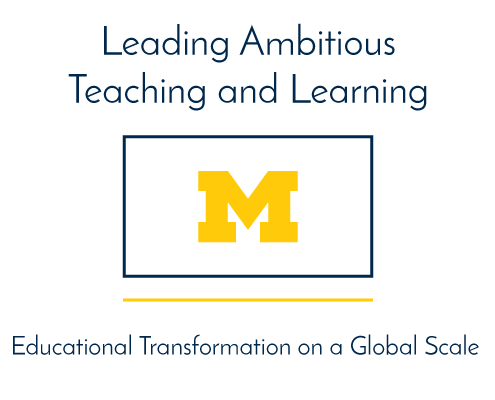 Contact us here and find info about our Academic Innovation Fund. 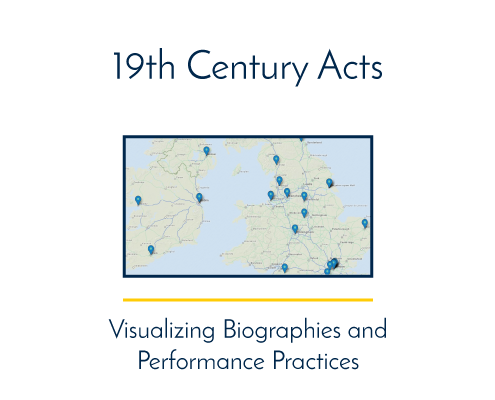 Visualizes historical biographies through explicit details on the geography, visualization, sight, sounds and gestures of the acts. 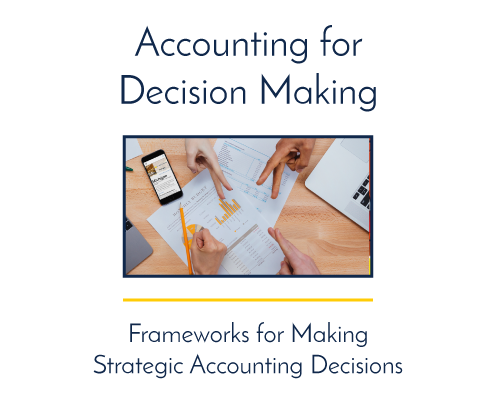 Helping learners develop a broad understanding of the way accounting is structured and how it can help frame the decision-making process. 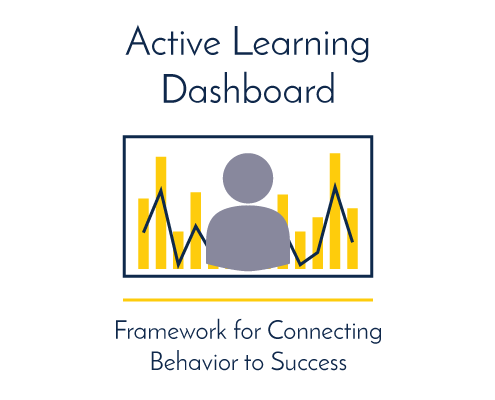 Visualizes relationships between student behavior and success data to allow faculty to better advise and assist students and inform DIG. 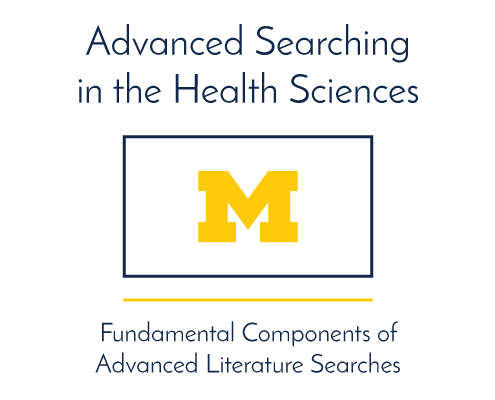 Teaches the fundamental components of advanced literature searches. 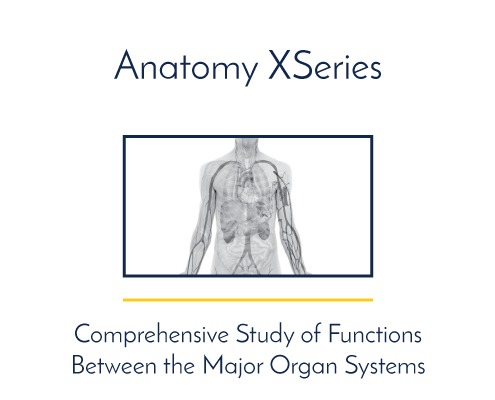 Creates a streamlined approach to the foundations of system-based human anatomy through a series of MOOCs. 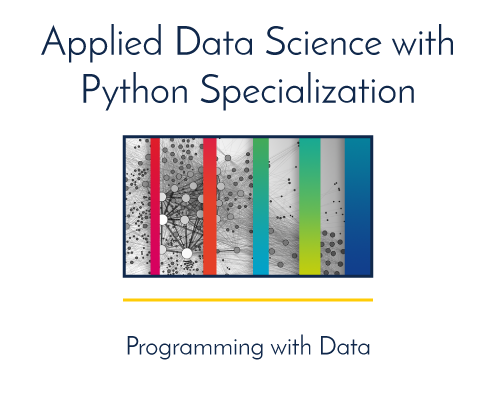 Using Python to understand and analyze data science methods. 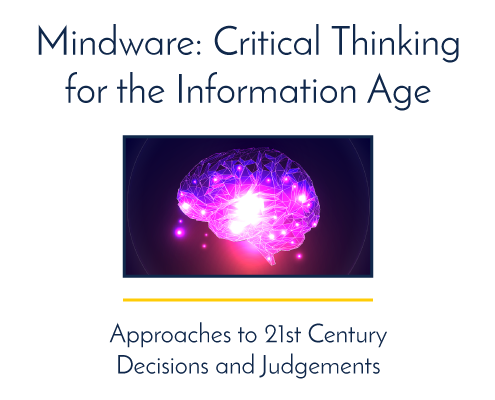 Increases capacity for financial thinking by providing learners with the fundamental tools to understand and engage in modern business. 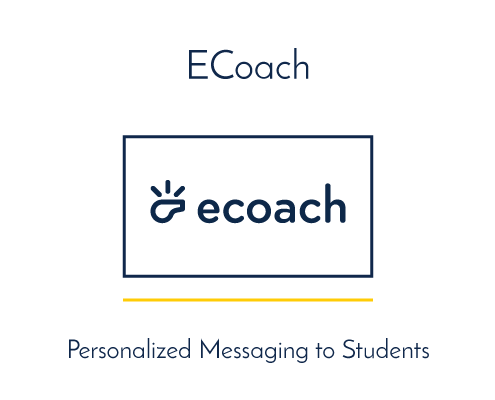 Provides Expert Electronic Coaching to students in large introductory STEM courses with personalized messaging. Creates a personal experience to learn how sci-fi/fantasy is shaped by our world, and how our world shapes sci-fi/fantasy. 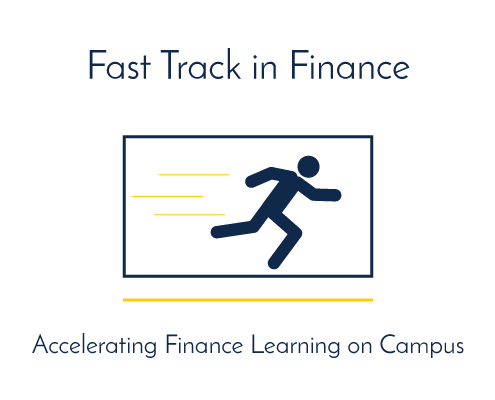 Brings insights from the Intro Finance MOOC to offer an accelerated finance course to Ross MBAs on campus. 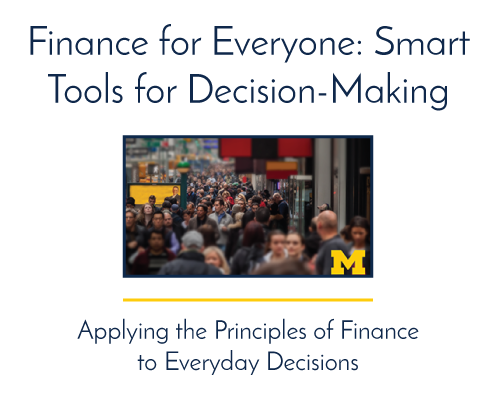 Showcases the beauty and power of finance by examining multiple applications to apply to your everyday life in this introductory course. Teaches about the finite element method as it applies to a range of problems in physics and engineering sciences. 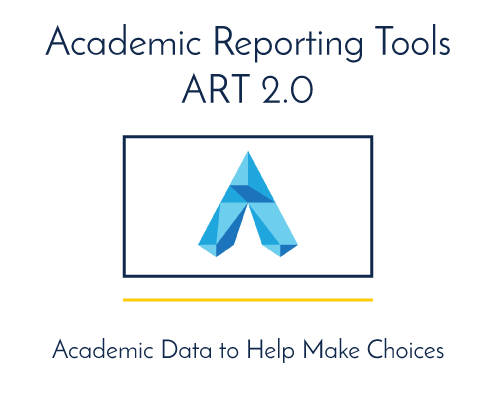 Brings hands-on writing and analysis into the classroom while maintaining lecture, example, and demonstration time outside of class. Addresses the breadth of design using a four-field framework: Commercial, Responsible, Experimental, and Discursive Design in this video. 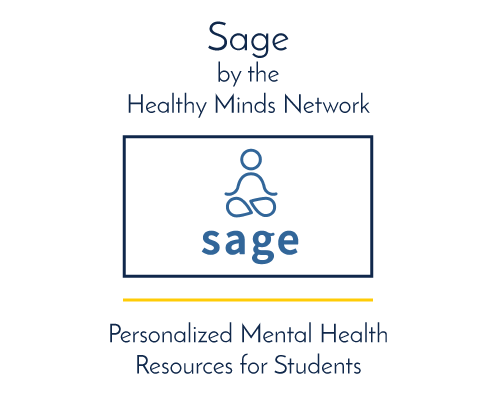 Opens teaching and instructional resources surrounding human care up for health professionals to re-mix and reuse. 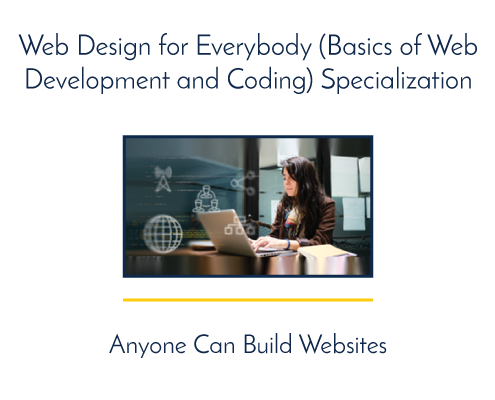 Promotes the circular development of the online and residential versions of this course about the challenges facing US Healthcare. Shows how the Internet was created, who created it and how it works through interviews with innovators who developed Web technologies. Offers students a view into Western classical music of the 18th/19th centuries that exemplifies tonality, major and minor keys. 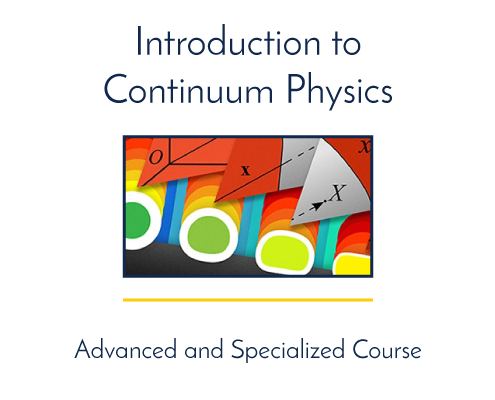 Provides specialized lectures on continuum physics, including solid and fluid biomechanics as well as materials science. 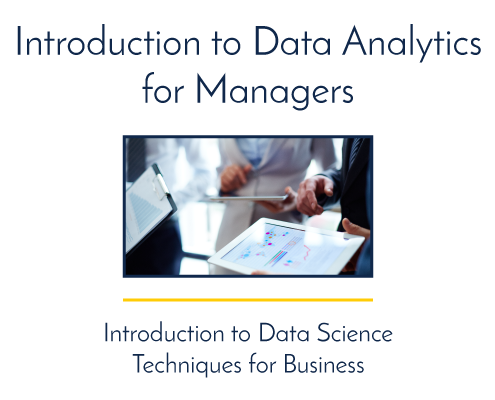 Tools to improve basic data science skills and apply data analytics techniques in a business context. Teaches the fundamental principles of valuation using both theory and real world examples to demonstrate how to value any asset. 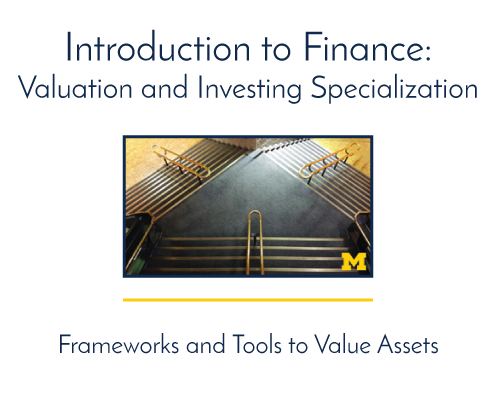 Enables learners to understand and apply the principles of valuation to any type of project or business through this modular specialization. 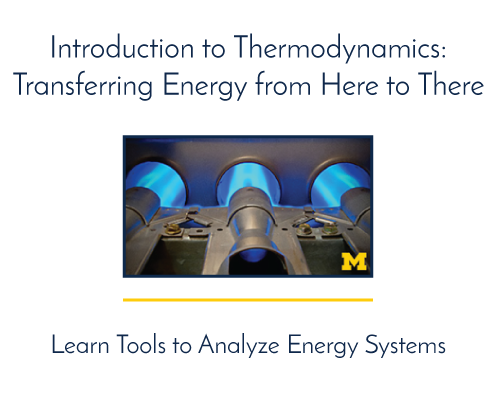 Communicates the many complexities associated with energy, and how we want to transition to new ways of using energy. 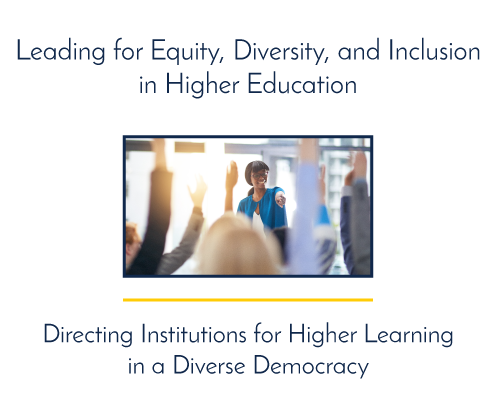 Uses contemporary case studies, interviews with institutional leaders and other interactive tools to help emerging higher education innovators further embed the values of equity, diversity and inclusion as core principles at their institutions. 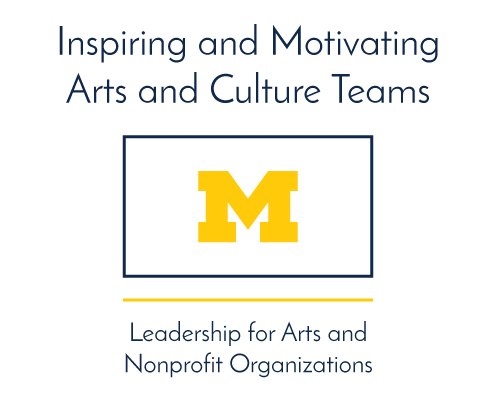 Provides diverse leadership experiences and best practices to teach essential skills for managing individuals and teams. 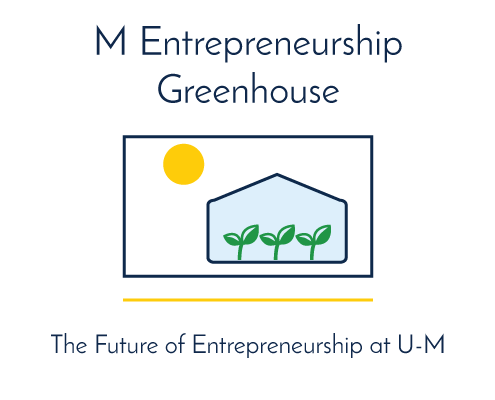 Connects entrepreneurship initiatives across campus to share up-to-date resources/practices and establish Michigan as a leader in the field. 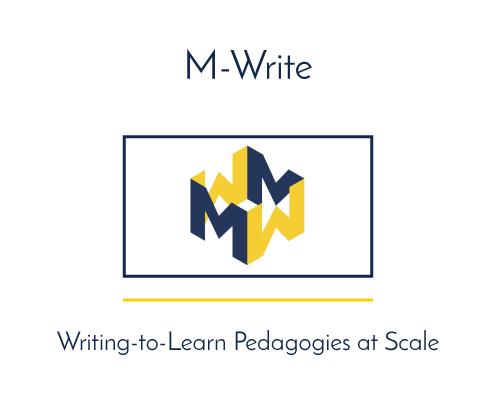 Combines conceptual writing prompts, automated peer review, natural language processing, and personalized feedback for writing at scale. Gives legally savvy local business leaders information on how proactive law can be used to create value for their organizations. 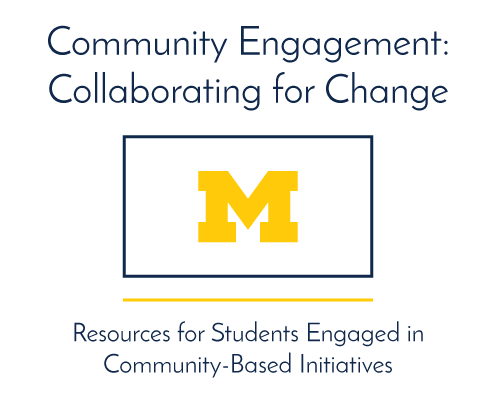 Reconnects learners from the "Model Thinking" MOOC to write a crowd-sourced book for use by future learners residentially and online. 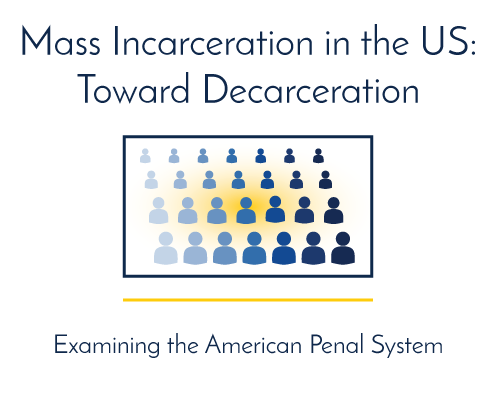 Provides an accessible and comprehensive look at the complex and multidimensional aspects of mass incarceration in America. 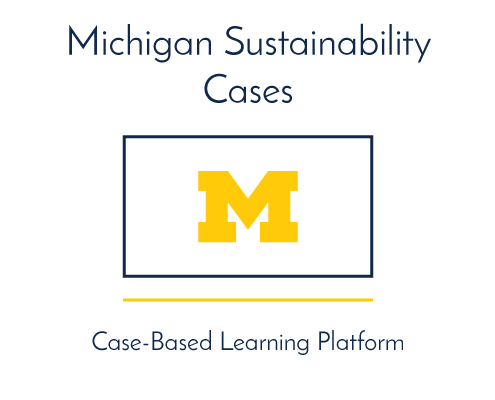 Integrates a web-based platform with multimedia content to provide a modular and immersive approach to sustainability. 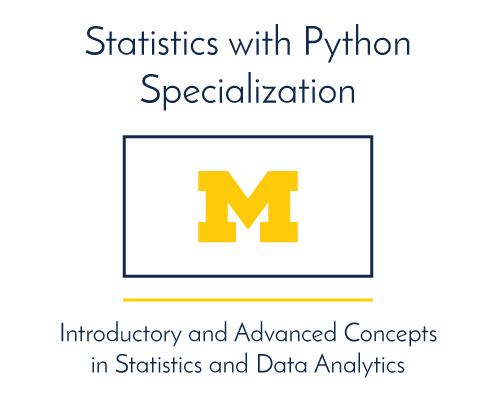 Teaches basic concepts of statistics, probability theory, the scientific method, psychology and microeconomics as they relate to everyday decisions and judgments. Models tipping points, the wisdom of crowds, economics, and the strategic decisions of firms and politicians. 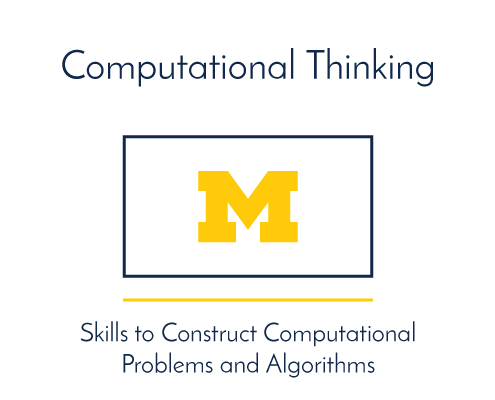 Teaches how natural language processing enables parsing, semantics, question answering, and sentiment analysis. 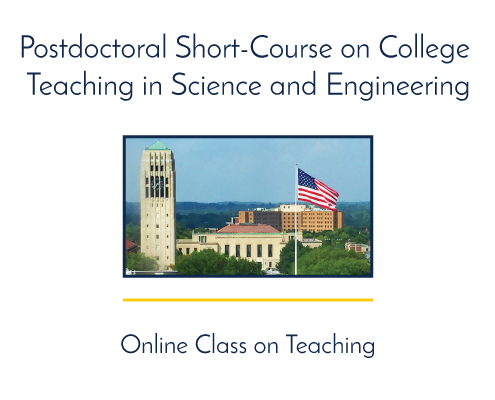 Broadens access to a highly successful early career course on teaching to post-docs at and outside of the U-M community. 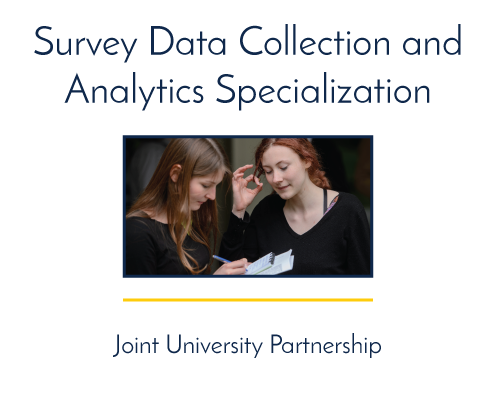 Offers multiple pathways to success in teaching how to use data to answer big questions about students in higher education. 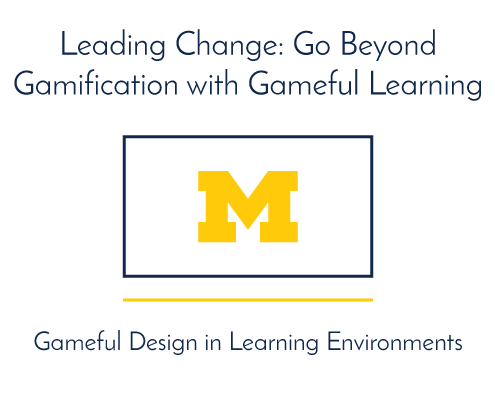 Speeds the contract learning curve by providing interactive games and exercises designed to help build comfort with contracts. 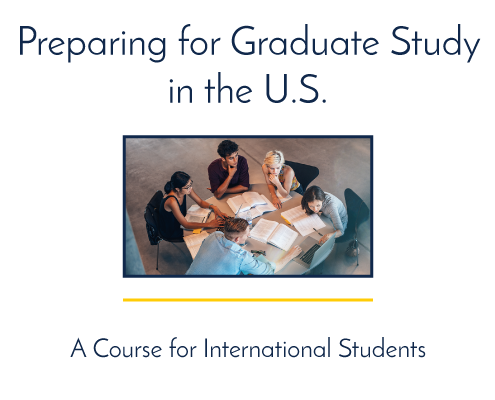 Provides international students with language training and acculturation in order to succeed in the U.S. graduate setting. 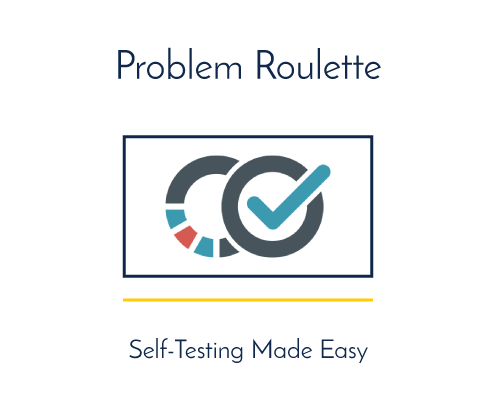 Provides students with access to a large library of past exam problems. 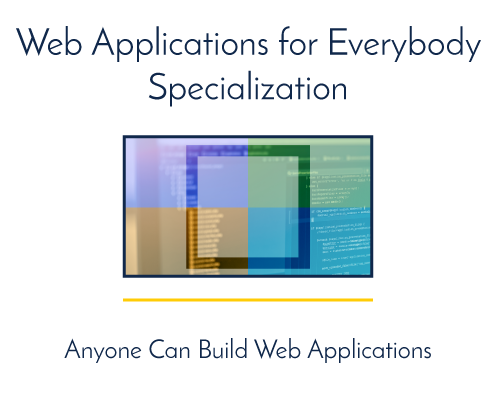 Opens beginner friendly introductory python programming educational resources up for everybody to re-mix and reuse. 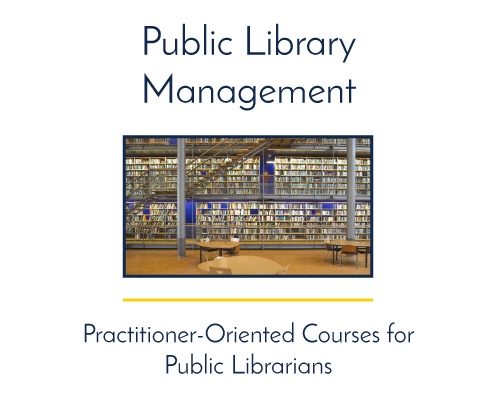 Provides a pathway for library professionals to expand their toolkit of management strategies. 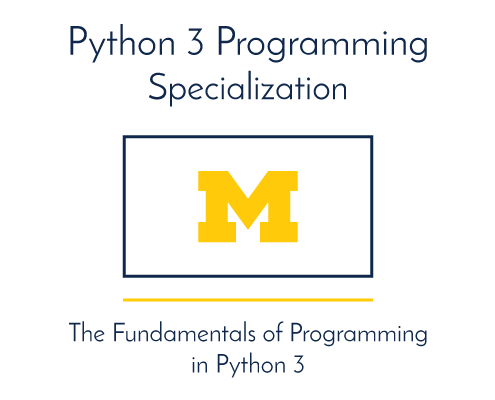 Introduces fundamental programming concepts including data structures, networked application program interfaces, and databases. 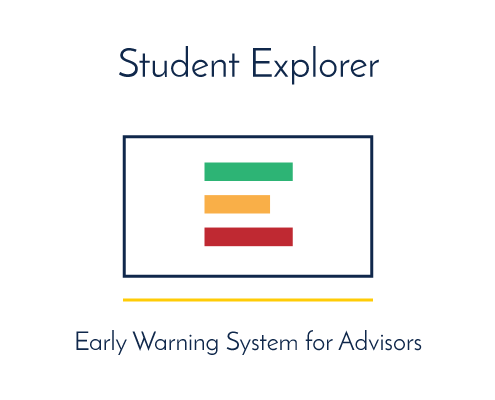 Teaches the process of question response, practical techniques for evaluating questions, and review methods of interviewing. 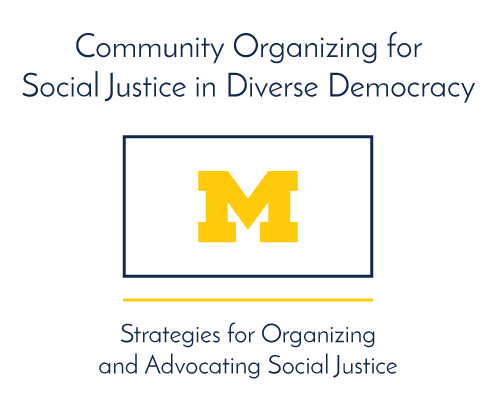 Focuses on what every citizen should know about the security risks and future potential of electronic and internet voting. 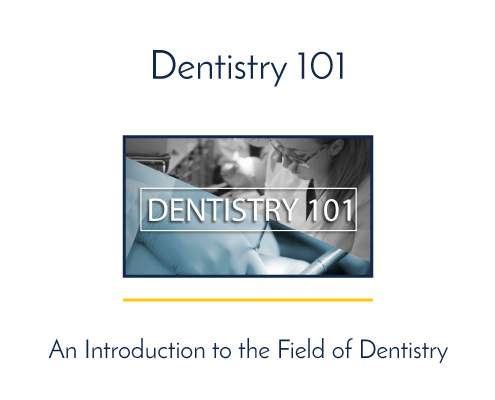 Teaches the origins of veteran care and how to manage the influence of bias, class, and power on the clinical encounter. 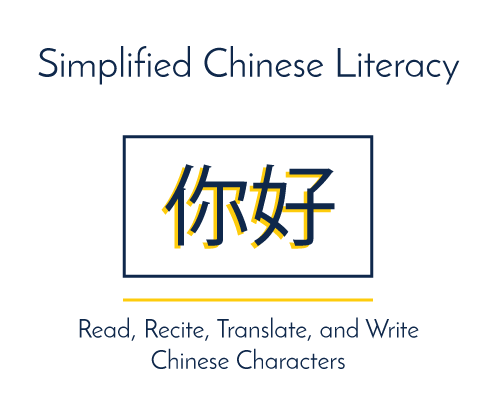 Combines authentic cultural materials with mobile technology to give students knowledge of 100 common Chinese characters. 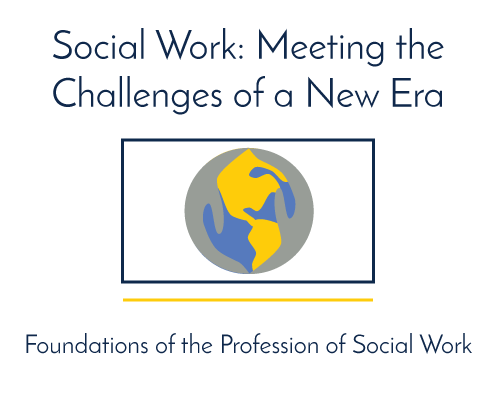 Integrates practice and theory in order to explore the foundations of the social work field through an educational and professional lens. 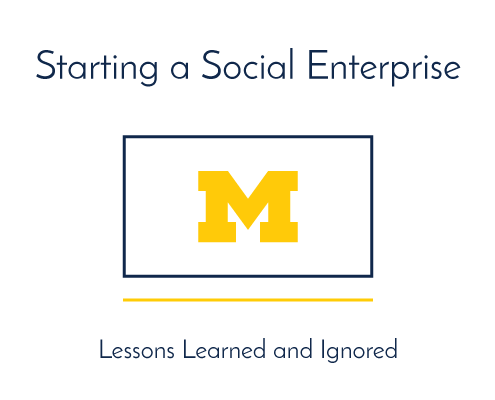 Guides learners to explore if, when, and how to launch a social enterprise. 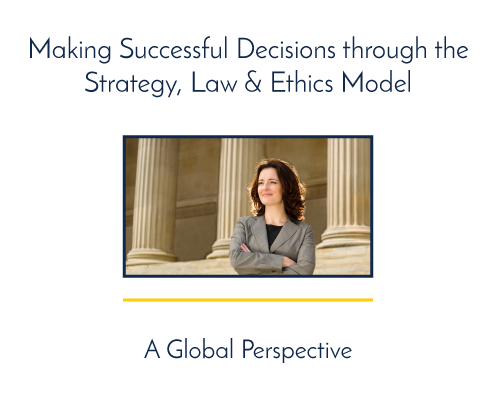 Provides strategies and skills that can lead to successful negotiations in your personal life and in business transactions. 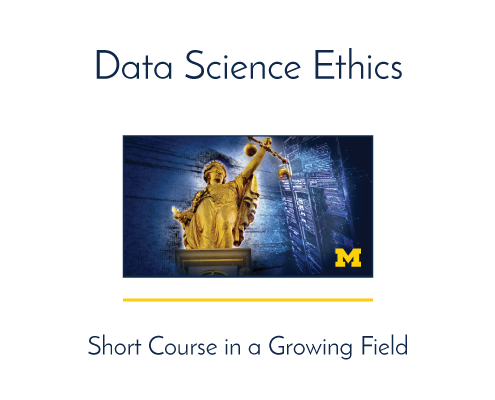 Teaches the fundamentals of survey design and analysis, lead by faculty from U-M and the University of Maryland . 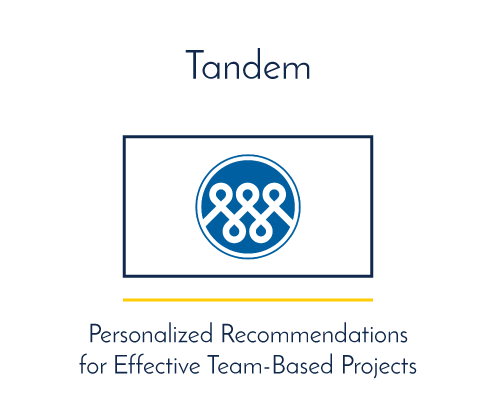 Helps students work better in teams. 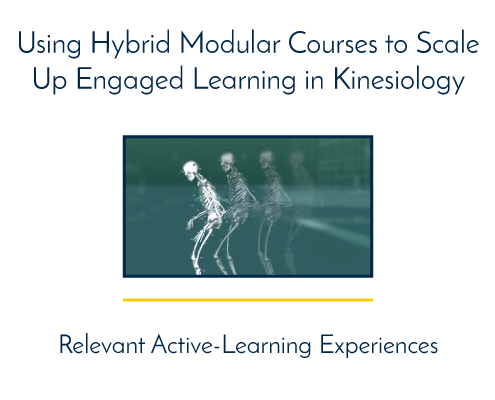 Improves feedback, clinical teaching, and assessment of clinical skills. 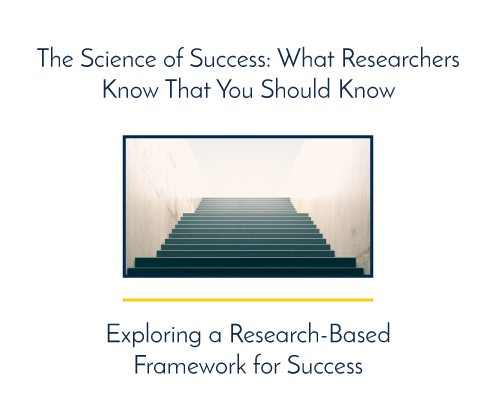 Leverages research-driven knowledge to build a framework for achieving personal and professional success. 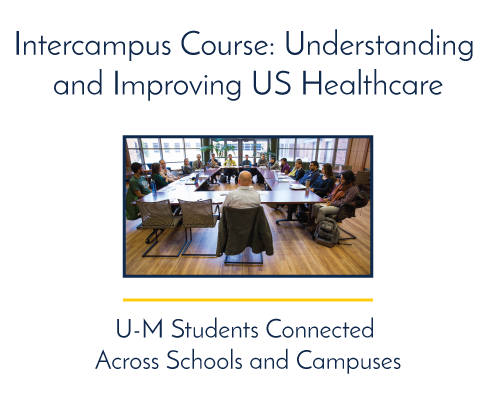 Connects residential learners to approaches by non-academic practitioners in the US and abroad in this course on lung cancer. 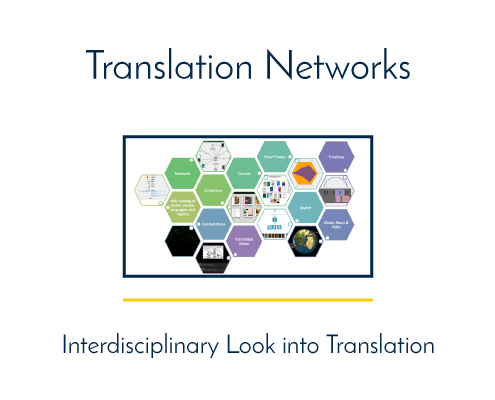 Surfaces and raises questions about the complexities of translation across categories, created by 8 U-M schools/departments. 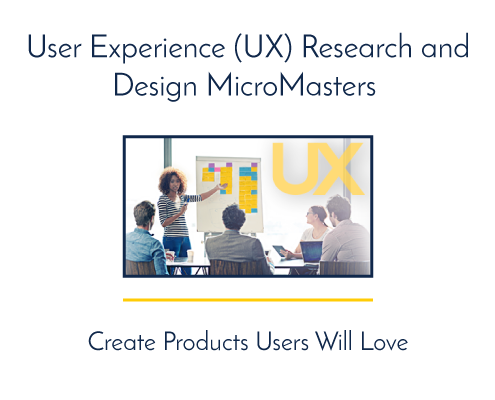 Teaches the skills to conduct research for the user experience. 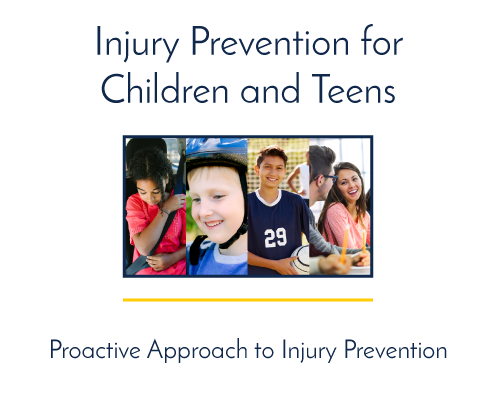 Provides more engaged learning opportunities, and increases curricular cohesiveness to improve critical thinking and inquiry/analysis skills. 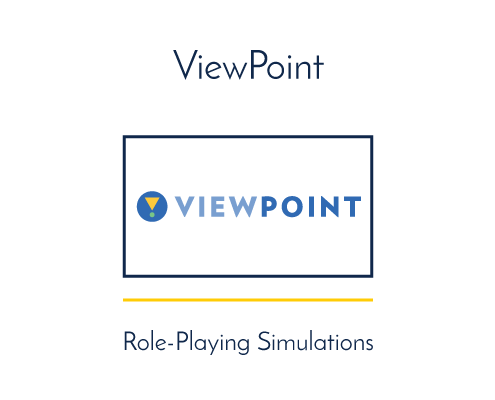 Provides instructors with a platform to create and implement engaged, interactive role-playing simulations in and outside of classrooms. 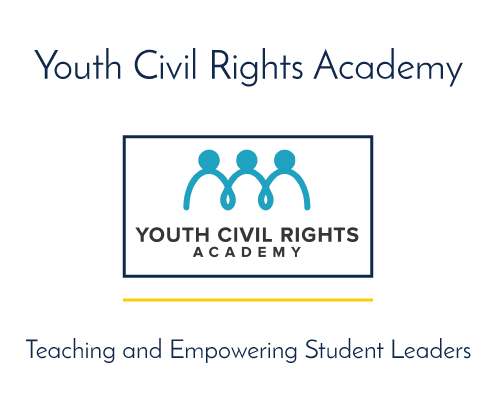 Prepares young people to become civil rights leaders in Michigan schools and communities.